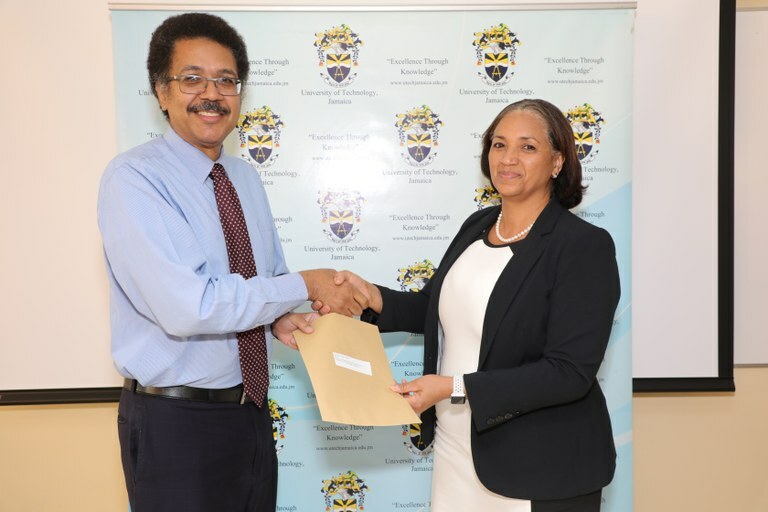 UTech, Jamaica’s Engineering Programmes Receive UCJ Accreditation — UTech, Ja. Prof. Stephen Vasciannie, CD, President, UTech, Jamaica presents Prof. Nilza Aples, Dean, Faculty of Engineering and Computing with the official letters of accreditation from the University Council of Jamaica (UCJ) for the Faculty’s Bachelor of Engineering in Industrial Engineering and the Bachelor of Engineering in Civil Engineering courses of study. The University of Technology, Jamaica has received University Council of Jamaica (UCJ) accreditation of its Bachelor of Engineering in Industrial Engineering and the Bachelor of Engineering in Civil Engineering offered by the University’s Faculty of Engineering and Computing. The accreditation is for the four year period commencing July 1, 2015. UTech, Jamaica President, Professor Stephen Vasciannie in welcoming the achievement, notes that the University is in the midst of an effort to gain institutional accreditation which would put “the stamp of quality” on the range of courses offered. He adds that the most recent accreditation of the engineering courses of study bodes well for the thrust towards institutional accreditation. For the President, “accreditation benefits the students of the University most of all; we are redoubling our efforts to achieve institutional accreditation for the University’s benefit and for that of the wider society,” Professor Vasciannie said. The full list of University of Technology, Jamaica programmes accredited by the University Council of Jamaica is listed on the Council’s website at http://www.ucj.org.jm/institution/university-of-technology-jamaica-utech/.